Fred Sanders and Oliver Crisp sure know how throw a party. Or “theology conference.” This past year’s LA Theology Conference was focused on the idea of “locating atonement” and they pulled out all the stops, drawing in names like Bruce McCormack, Matthew Levering, Michael Horton, and a host of others. Their stated aim was to take us beyond the important, yet typical questions plaguing atonement discussions over the last 70 years such as: How many typologies or “theories” of atonement are there? Which one is right? How do we relate them? and so forth. Instead, they tasked their presenters with examining the subject of atonement in light of its relations to other doctrines. Ten months later, they’ve delivered an exciting new volume on atonement theology Locating Atonement: Explorations in Constructive Dogmatics. As a general comment on the collection of essays as a whole, it’s important to note that they’re not presented as one, unified work. There is a diversity among the contributors with respect to issues like impassibility, penal substitution, how much “ontology” plays a role in our accounts of atonement, and so forth. That said, a few characteristics come through. First, they’re all top-notch. Second, they demonstrate a broadly catholic, if predominantly Western orientation, attuned to the theological tradition that comes before it. Finally, as technically erudite as these essays can get, all of them have their eye on the preaching and teaching of the Church, not merely the formulations of the academy. Though all the essays were worth engaging–so I will–my comments on each will vary because, well, this review got away from me. That said, length of summary should not be necessarily read as an indication of the relative value of each essay. After Sanders and Crisp’s intro, Adonis Vidu opens up the constructive essays by taking up a thread in his work in Atonement, Law, and Justice on simplicity and divine action (one of my favorites of 2014). Specifically, he sets about trying to set the atonement in the context of the trinitarian principle that the external works of the Trinity are undivided. In other words, there are no works that the Son does in which the Father and the Spirit are not intimately and also equally involved since they have one shared nature, will, and mind even though possessed their own particular way. So, while it is the Son who becomes incarnate, he does so in the power of the Spirit and in accordance with the will of the Father and so forth. Using this classic principle and a strongly Thomistic account of simplicity and pure being, Vidu tries to help smooth out some of the less helpful ways we popularly think about atonement, specifically with the idea that the Father is somehow acting on or against the Son in a way that threatens the unity of the Godhead. In doing so, Vidu raises some important and salutary concerns, trying to direct our attention to the classic tradition which formed the theological context in which our atonement doctrines were originally formulated and outside of which, it can likely only suffer distortion. My only concern is that while he has forcefully and rightly protected the undivided unity of action, I’d love to see him fill out the distinctness within that unity a bit more. Matthew Levering’s delightful essay relates the doctrine of creation and atonement by engaging Nicholas Wolterstorff on the issue. Wolterstorff recently challenged the “reciprocity principle” at the heart of satisfaction accounts of atonement, essentially by appealing to Jesus’ rejection of the principle in the Sermon on the Mount. This, in turn, shapes his objections to classic satisfaction accounts. In response, first, Levering counters by showing that Wolterstorff’s reading of Jesus and the New Testament is simply wrong on its own terms. Jesus actually reaffirms the reciprocity principle in a number of places as do the apostles. Second, he grounds this reading theologically by expounding Aquinas’ account of God’s gift of distributive justice with the gift of creation. But I won’t blow that for you. Suffice it to say that this is a quintessentially careful piece of theological reasoning from Levering that you won’t want to ignore. In his piece, Jeremy Treat argues that covenant is an integrative doctrine for atonement theology, which allows us to cut through a number of false dichotomies plaguing us in the contemporary discussion. In a sense, he strives to give a broadly covenantal approach, situating Jesus’ work as the recapitulation and fulfillment of the story of Adam and Israel, attempting to appeal even to the non-Reformed. Using covenant as the key grid for organizing our understanding of atonement, Treat argues that atonement can be both legal and relational, individual and corporate, retributive and restorative, as well as make sense of the unity of Christ’s atoning life, death, and resurrection. These twenty pages would save us all a lot of grief if they were broadly digested within the church. Also, if you haven’t picked up Treat’s The Crucified King–which you should have–this ought to whet your appetite for it. Benjamin Myers offers up a piece relating atonement and incarnation by expositing the “patristic model” of atonement. In doing so, he’s trying to move us past Gustaf Aulen’s rather skewed “classical” ransom account of atonement offered up in Christus Victor, which tended to obscure things a bit. In past times, writers like J.N.D. Kelly had referred to this stream of thought as something of a physicalist account because it hinges on the Son becoming man, joining his immortal deity to our mortal natures, passing through life, and overcoming death by filling our mortality with his unconquerable life through resurrection. And that’s a horrible summary of Myers’ careful 12-step case. Myers has done us all a favor in highlighting and recapturing a stream of Patristic thought often lost to us in the post-Aulen discussion–a 12-step program, if you will. My one argument is with his treatment of Athanasius that, for my money, tries a little too hard to screen out the penal and forensic elements within it. Indeed, it’s rather instructive to compare his essay at this point to Levering’s earlier appeal to those same passages in conjunction with Thomas. All the same, strong showing from the Australian contingent. Kyle Strobel and Adam Johnson have a rather unique essay on the relationships between wisdom and atonement. It’s a rather phenomenal little piece that treats the atonement as a work of God’s Wisdom, rescuing the world from its folly through the foolishness of the cross. I’m temped to say it’s almost a way of retelling the whole economy of redemption from the angle of wisdom. It’s a treasure trove of theological insight (might have been the most surprising essay at the conference for me) and word on the street is Johnson is following it up with a little work on atonement that should be smashing. Luke Stamps treats the often-forgotten yet crucial doctrine of dyothelitism (that Christ had two wills, a human and a divine one according to each nature) with respect to the atonement. This is one of those places where clear, systematic thinking is most helpful with exegesis. There are number of key insights here, but for me, the bit that finally clicked was the way monothelitic accounts of Christ’s will, of necessity, require a social trinity doctrine. Without understanding that Christ has two wills–one human and one divine will shared with Father and Spirit–the only way Christ can pray “Not my will but yours”, is if the Son as God has a will distinct from that of the Father and the Spirit. Some might want to go there, but Stamps shows why this reading might have some costs to our doctrine of the Trinity we should not be willing to pay. Daniel J. Hill and Joseph Jedwab’s essay focuses on relating atonement and the very concept of punishment. Without actually arguing for its justness, they present an argument for the conceptual coherence of the idea of the Son being punished for or assuming responsibility for the sins of others. It’s a fairly analytic essay and, for what it aims to do, fairly helpful. That said, it’s necessarily quite limited. Eric T. Yang and Stephen Davis offer up a piece analyzing the link between wrath and atonement. They present a somewhat standard defense of the notion of the appropriateness of affirming wrath as an affection or emotion in God, with a disappointing but typical rejection of impassibility. What’s more, they argue that not simply penal substitutionary accounts, but other forms ought to consider incorporating a robust notion of divine wrath in their readings of the atonement. T. Mark McConnell relates the doctrine of atonement with the much-neglected issue of shame as distinct from guilt. Guilt says, “I have done wrong”, while shame says, “I am wrong.” According to McConnell, not only are we living in a society that is awash in shame, even if it’s lost its sense of guilt, at the heart of the Scriptures is a story about God overcoming Adam’s nakedness and shame in the Garden. Drawing on Ireneaus and the theology of the vicarious humanity of Christ from T.F. Torrance, McConnell lays out the way that understanding atonement as recapitulation allows us to see Christ reconstituting and remaking us as overcoming of our alienating shame in his reconciling life, death, and resurrection. Jesus is the one who bears our shame away, killing it on the cross, and clothing us once more. Overall, this is a very important pastoral dimension to the atonement that ought to be regained where it has been lost. That said, I would definitely shy away from adopting the “fallen humanity” view which McConnell has forwarded–I think something like his model can and must be constructed without it–nor would I necessarily foreground shame as prior and deeper to the problem of guilt as McConnell has. Bracing essay, nonetheless. Alongside Vidu’s, Bruce McCormack’s essay on atonement and human suffering is the densest of the various pieces, defying easy summary. It’s also one of the most conflicted for me. In order to treat the problem of suffering and the will of God, McCormack develops a theological account of the death of Jesus as the will of God. First, he treats it in terms of the Gospel accounts where Jesus’ death is seen as the apocalyptic outpouring of the wrath of God upon the Son. McCormack then turns to deepening the New Testament witness through H.U. Von Balthasar’s profound theology of the cross and his account of the judgment of hell and being with the dead. Though, of course, with his own Christological corrections. With this account in place he argues for the uniquely redemptive nature of Jesus’ death as an answer, not to mere physical death, but as the foundation for the resurrection. It is a condemnation of the old order, paving a way for the new. For myself, I couldn’t go with this tinkering with impassibility, view of synthetic construction of the gospels, and a couple other Barthian themes related to God’s being and history. All in all, though, a stimulating and moving read. I’ll be blunt and say that Elenore Stump’s was the most frustrating for me. Of course, it was sharp work. It is Stump; she’s brilliant. But theologically, her attempt to offer a cut-rate account of the atonement’s relation to the Eucharist thinly-conceived, had some some rather semi-Pelagian tendencies. That said, her discussion of second-person experiences and the role of story in our spiritual formation was illuminating. 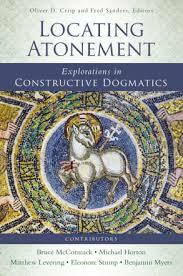 Michael Horton rounds out the books with his chapter on Ascension and atonement. He provocatively sets out to answer H.U. Von Balthasar’s charge that Protestantism can’t encompass or reckon with Ireneaus’ basic attitude in theology. He does so in tracing out two streams of thought on ascent and descent, salvation, and metaphysics. One is an Irenaean stream and another Origenist, with Origen the less congenial of the two. It’s a tale of two ascensions, two deifications, two Eucharists, and two metaphysics. Unsurprisingly, Calvin and the Reformed tradition a la Bavinck are clearly the heroes here. And I agree with that point. But Horton does his best to show them in continuity with a broader “catholic” tradition, as well. Again, this one defies simple explanation, but it’s really a first-rate piece to close down the house. Well, that about wraps it up. If you haven’t picked up on it, yet, I highly recommend the volume. Oliver Crisp and Fred Sanders have done a bang-up job pulling this all together. Truly dominant-looking theological man. It’s a win for Reformed beardliness everywhere. 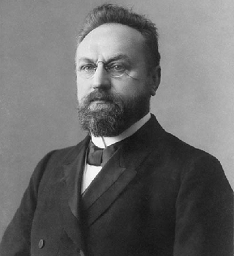 Herman Bavinck is one of the, if not the, finest, confessionally-Reformed dogmaticians of the last two hundred years. Anyone who has encountered his work and knows the depth of his learning, his sound orthodoxy, and creatively faithful articulation of the Reformed faith in the face of his modern context. Those same readers, though, could also testify to Bavinck’s credentials as a theologian of the Church catholic, despite his location at the small confessional school at Kampen. Indeed, George Puchinger notes, “History has its ironies but it cannot be denied: the most ecumenical protestant dogmatic theology in fact appeared in Kampen, the place where theology was practiced in the most isolationist manner” (cited in James Eglinton, Trinity and Organism, pg. 93). Bavinck’s method of developing doctrines historically and organically certainly played a role in this. In pretty much every locus in the Reformed Dogmatics, Bavinck takes the time to review each doctrine according to broader cultural material, as well as the Old and New Testament witness. A large bulk of his chapters, though, consist of an extensive historical survey that give an irenic account of each topic from the Fathers (East and West), to the Medievals, through the Reformation, Counter-Reformation, Post-Reformation, and modern period across Roman, Lutheran, Reformed, and Radical traditions. But even Bavinck’s skill as a historian doesn’t cut to the heart of his Reformed Catholicity. References to Augustine, the Cappodocians, Hilary, and Pseudo-Dionysius, as well as Thomas, Scotus, and the medievals all play a role in his formation of doctrine now. That’s because Bavinck had a depth theology of the witness of the Holy Spirit in the tradition of the Church that speaks to his approach to dogmatics. Abstractions—universals—do not exist in reality. The tree, the human being, the science, the language, the religion, the theology are nowhere to be found. Only particular trees, human beings, sciences, languages, and religions exist. Just as a language is associated with a particular people, and science and philosophy are always pursued in a certain school and ideological context, so religion and theology can be found and nurtured only in a related community of faith. Of course, that means that we come to knowledge of our faith on in the churches we inhabit–they are the “natural soil” of religion. There are limitations to this, of course. There isn’t one pure theology, or pure church, but many churches and many theologies. And it will be this way until the church reaches the maturity and the unity of the Son of God at the end of all things (Eph. 4). That said, the churches, for all their division, are not disqualified from the purposes of God with respect to our knowledge of the truth. It is not apart from the existing churches but through them that Christ prepares for himself a holy, catholic church. Nor is it apart from the different ecclesiastical dogmas but through them that the unity of the knowledge of God is prepared and realized. This significance of the church for theology and dogmatics is grounded in the link that Christ himself forged between the two. He promised his church the Holy Spirit, who would guide it into all truth. This promise sheds a glorious light upon the history of dogma. It is the explication of Scripture, the exposition that the Holy Spirit has given, in the church, of the treasures of the Word. Bavinck sought to craft a dogmatics that blended its voices into the that of the broader choir of the church throughout the ages, even as he sung it in his own deep, Reformed baritone. None of this, of course, threatens the Scripture principle. Though the dogmatician is a student of the tradition, learning from what has come before, grateful for that deep cloud of witnesses, Scripture not the Church, is still the self-authenticating norm of all theology. All the same, it is his commitment to Scripture, or rather, the Triune author of Scripture, that authorizes Bavinck’s aim to speak beyond the confines of his own Reformed tradition to speak to the broader Church over which Christ is Lord.